Abena Abri-Form PREMIUM Briefs have earned a reputation for superior quality and super absorbency. These briefs are more than "cloth-like," they are completely "breathable." Humidity and heat is transported away from the skin while urine and odor remain inside the product. The advantages of this technology are that the skin is kept dry, and temperature is being normalized; which reduces the development of skin irritation and diaper dermatitis. Furthermore, the cloth-like backsheet is soundless and discretion of the user is ensured. 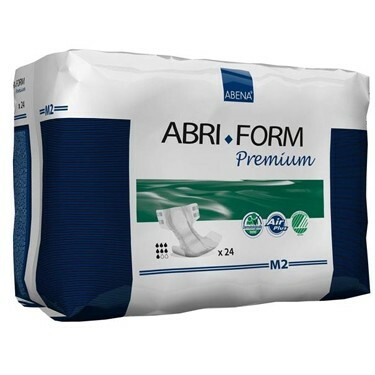 Abri-Form PREMIUM Briefs have been released with different absorption capacities based on four levels. Level These Level 2 Abri-Form Briefs feature soft standing leakage barriers, wetness indicator, refastenable tabs, an elastic waistband, odor guard, and unsurpassed quality of construction. And most importantly, Abri-Form Briefs absorb more than U.S. manufactured products. For example, just one Level 2 brief offers up to two times the absorbency of a typical store-brand product. No perfumes, scents, no chlorine, no oil based products, no dioxins, no pthalates, no latex. lived up to expectations . Up to 12 hours overnight with no leakage. I do not think it is a good product for an Alzheimer's patient, at least in my hands!! Cons:It was difficult to put on & did not cover properly!! This was the first time I bought them. My #2 choice for diapers now. M4s are too thick and heavy for me. Plan to try M3s sometime in the future. Pros:They were very comfortable and discrete, while taking several wettings. This diaper was ok. It would have been better if it was plastic backed instead of the cloth back. Tapes hold much better on the plastic backed diapers. I find that the tapes on the cloth backed diapers have to be adjusted more often then on the plastic backed ones and they also sag more when wet. Whoever decided to do away with the plastic backed diapers must not actually be a user or they would know about the lower quality of the cloth backed ones. Cons:Tapes tend to slip and need to be adjusted often. Sag when wet. When I called for help in finding a better product, customer service was extraordinarily helpful with professionalism and compassion. Thank you so much!